You ring your little bell all day. You dare to make a sally. And then you get the sack. Then Joanie has her say. He must be making “piles”! One day, he’ll go too far. With many thanks to my friend, Peggy, who has shared another poem with me. She wrote this one in Camberwell in 1951 when she worked for G. J. Coles, now called Coles Myer. I need to apologise to anyone who was looking forward to ‘pearls of wisdom’ from me over the last couple of days. I’ve only really got a half an excuse for yesterday. I generally write at night as I find I write better when I’m tired and last night it was challenging to concentrate on anything useful. It was the night that changed the world, well someone’s world. It was the night we heard rumours of a spill in the leadership of Australia. Prime Minister Kevin Rudd eventually announced there would be a caucus vote this morning and there was so much speculation in the world of Twitter and so much to watch on TV that I just wasn’t able to focus to even type up a poem. Today ended up being a very historical day as we ended up with our first female Prime Minister. Mr Rudd stepped aside and Julia Gillard was voted in and subsequently sworn into the position of Prime Minister. This is a big step for Australia and I admit to being rather distracted last night and this morning. Anyway, what I would have been posting last night is a poem. It’s not mine and I don’t believe it’s been published anywhere else. The author is a friend of mine from the op shop. Peggy is currently in her eighties, that’s her chronological age and her body age is probably closer to 120, but she has great spirit and keeps going despite everything. She left school at the age of 14 and is totally fascinated with words having done crosswords and other word puzzles for many years. She’s fairly well read and literate and the other day gave the honour of showing me her poems. She doesn’t show many people and as I was rather taken with a couple of them she’s letting me show them both to you. This one was written in 1939. And she’s so very true. Who tells my Mummy, all I do. And I want her to see it, before she is told. I found it tucked in my old cot to-day. And when she has seen it, I’ll show it to Dad. With the sweetest baby, you ever have seen. It’s the weekend many geeks and pop culture aficionados look forward to, and I nearly forgot about it! Luckily, I had a friend volunteering at Supanova who reminded me, and shortly after I read an email from my studio lecturer who knows this kind of event is “right up my alley”. I and my pop expo buddy went together, endeavouring to come early. I’m glad Supanova’s held at the Showgrounds because that makes my life much easier by being able to drive in, rather than slugging my way into the city via public transport! Naturally the queue was already in full swing when we arrived. I was dreading the organisation and logistics of the event, as my personal experience knows how poor they tend to be, but I have to congratulate the organisers for being generally efficient, and hiring firm but approachable volunteers. I think the average queuing time was just 30 minutes or less, which is a very good figure, considering how notoriously long waiting can be at conventions. Usually I try to set a budget limit (I see the comic book stalls and my mindset goes into instant WANT WANT WANT mantra), but given the quite fantastic celebrity line-up I decided to “splurge” a tad more than what I normally would. Without a doubt I eagerly signed up for James Marsters (photo and autograph, of course!) 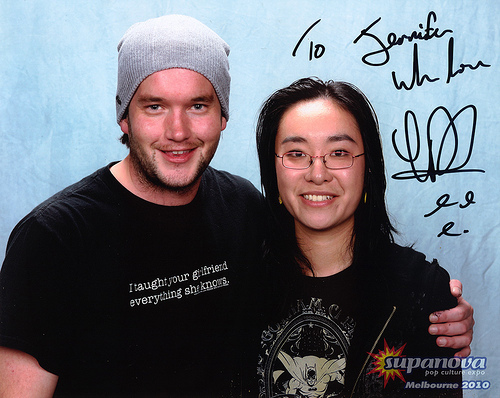 of Buffy and Torchwood fame, plus Gareth David-Lloyd, seen in Torchwood and Doctor Who. Given the immense popularity of these guys, especially James, there was little time to converse with them at some length. Add to that I was just so starstruck that I could barely string a “Hi!” with a “How are you?” No matter how many famous people you meet, you just can’t get over the fact you’re seeing them face to face! And that they’re talking to you, acknowledging your existence by the fact that you’re standing there in front of them! James was coming down with some bug, so close contact and hugs were out of bounds, unfortunately! But people got creative in their restrictions, which was fun to see! Awe aside, that was $150 down the drain just to grab hold of the fifteen minutes with fame, and I don’t regret it! Later, I went on a hunt for comic books by the guest artists. 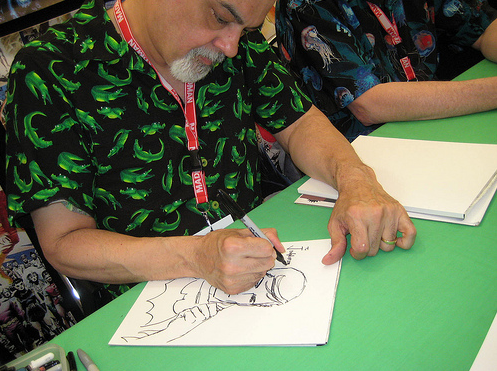 There was quite a varied turnout of talents, both writers and artists, but I was mainly interested in George Perez and Marv Wolfman, both of whom revolutionised comics in the 80s and 90s, especially in their work with DC. 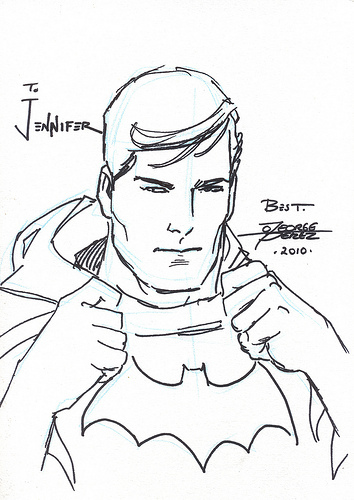 I forked out quite a bit just to get a lousy laser print of George’s beautiful rendition of Wonder Woman, but I had no choice since that was the only way I could get an additional sketch by George. Still, that sketch made my day blissfully, utterly complete. I spent quite an agonising time beforehand trying to come up with an idea for George to draw for me; ideally I wanted an amorous interlude between Catwoman and Batman, but I suppose that was too ambitious (!). I settled instead for Batman (Bruce Wayne) with his cowl/hood down—a somewhat more intriguing approach to the Dark Knight than say “just Batman” (though George himself did say that was the second request of the same thing!). Add to that George and Marv were absolute darlings—very warm and friendly, and happy to sign autographs and pose for photos. They have my utmost respect and adoration. Put frankly, I’m glad there are only two major pop culture conventions in a year in Melbourne—Supanova usually in April, and Armageddon in October—because in a place such as this, I run wild with fangirlish madness; consequently my savings get hard hit, but you know, that’s what the months in between compensate for. I wouldn’t really have it any other way! Jennifer Wu is a graphic designer based in Melbourne, Australia. Her work and life is largely (absolutely!) informed by her passion for popular culture and history through the ages. She likes to think she has a way with words and images. Currently she is channelling her obsession for kitsch, collecting and the culture of excess in a major project for her Honours degree. She welcomes any comments or questions! You can catch her on Twitter or see her blog and work. Well, tonight I get the pleasure of introducing tomorrow’s post. I first met Mark in 2004 when I joined the Australian Discworld Convention Disorganising Committee. I was bored and looking for something new and different to do so I joined the committee. Mark was a Committee member for the first Convention and took over the role of Director for the second Convention, he appointed me his Vice which meant many conversations and I hope we will remain friends for a long time. 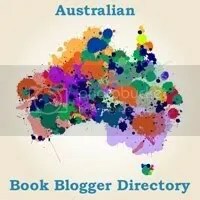 Like me, he is very interested in books and when our discussion strayed onto the topic of blogs I had no hesitation in asking him to write for me. Despite being much younger than me he seems to have read many of the books I value from my childhood. I asked him to choose an author he values a lot and so he chose Sara Douglass. This is good for me as she’s an author I’ve never read and therefore it’s good for you as you get to view the author through the eyes of someone who loves her work dearly. Should you be inspired and wish to join the committee or just attend the next Australian Discworld Convention you should visit here as full details will be posted. I’m feeling rather lazy today and have spent part of the day watching Angel instead of doing useful stuff so in keeping with that theme of me being lazy I’ve talked a young person I know into writing a guest blog. Jay just finished Questors by Joan Lennon and here’s what she thinks of it. An enthralling read, filled with clever coincidences that feel perfectly natural, culminating in an exciting ending that is both expected and unexpected. She also mentioned that the gender of one of the characters is uncertain until the end of the book, this is a natural condition in this world. Now you want to know what Grug has to do with business. Well, besides being very collectable I just happened to have a friend who has memories of Grug and seeing that Grug is going to be republished this month by Simon and Shuster and Melissa just happens to be in business I thought there’s the obvious connection. Melissa is the founder of the Business Mum’s Network. This is a wonderful group that helps mums to make your business the best possible. They offer a supportive network comprised of a forum, speakers, an annual conference (more below) and also a select group called The Profit Club that meet every other Wednesday during term for group business coaching by Katherine Doe from Action Coach Australia. Visit the Business Mum’s Network and have a look around, it doesn’t cost the earth and it’s great. If you’re interested in attending The Profit Club email either Melissa or myself. After a recent Profit Club session I was talking to one of the participants about books and the topic shifted to Grug. She hadn’t heard of Grug and Melissa kindly spoke up with a precis of Grug and how she knew it so well. Knowing that Grug is about to be republished I couldn’t resist this snippet and asked her to write me this story. She very quickly obliged and the result will be posted here in a couple of days. The Business Mums Conference is on the weekend of the 21st and 22nd June in Holmesglen TAFE. It’s a fabulous weekend specially designed for mums in business and will help you recharge your batteries, also giving you lots of ideas for your business. Any of my readers who also signup and attend the conference will be able to pick up their orders at the conference for free postage and also receive a 20% discount. See Business Mum’s Conference for further details and to sign up. Edit: Sadly, the Profit Club I attend is no more. If you’re still interested you could always contact Katherine Doe to see if she’s doing another one elsewhere. DAME AGATHA CHRISTIE’S SHORT STORIES – UNTANGLING THE THREADS. I declare that the following article is my own work. When, on 6th October 1952, ‘The Mousetrap’, a play written by Agatha Christie, opened at the Theatre Royal in Nottingham, England, it had already undergone transformation from a radio play to a short story and then into the stage play. The play, ‘The Mousetrap’, was based on the short story, ‘Three Blind Mice’, written by Agatha Christie in a collection of her stories entitled ‘Three Blind Mice and other Stories’, which was published only in the United States of America in 1950, but the short story had previously been published in England in a women’s magazine in serial form. ‘Three Blind Mice’, a thirty minute radio play, was written in response to Queen Mary’s request for a play by Agatha Christie to celebrate her 80th birthday and was transmitted by the BBC on 30th May, 1947. On 25th November, 1952, ‘The Mousetrap’, the stage play, opened in the West End of London in the Ambassadors Theatre, and ran there until 23rd March 1974, when it was moved to the larger St Martin’s Theatre, next door, opening on 25th March 1974, keeping its ‘initial run’ status, where it still plays. It is the longest running play in history, and as requested by Dame Agatha Christie, the short story has never been published in England in any short story collection. Film adaptation, under the contract conditions of the play, will not be considered until the play has stopped running for a period of six months. Such is the acclaim for Agatha Christie, often dubbed ‘The Queen of Crime’, and her works, in 1962, UNESCO claimed she was the ‘most widely read British writer in the world’, beating William Shakespeare for the first position. With her deft writing skills, Christie taunted her readers, laying red herrings to confuse them, and tacitly challenging them to unravel the mystery within her works. Her characters were believable and her writing style was fluid and compact. Author of numerous novels, radio plays, television plays and other works, Christie wrote 160 short stories. Her novels beguile us, but her collections of short stories may have exactly the same effect for a different reason. While some collections of Christie’s short stories share the same title in the UK and in the USA, most do not. Many of Christie’s books were published firstly in England then later in America. To appeal to the American market, the titles were sometimes changed and another cover picture was created, more appropriate to the American life-style. ‘Poirot’s Early Cases’ (UK) was changed to ‘Hercule Poirot’s Early Cases’ for the American market, presumably because Hercule Poirot at that time was not as well known in America as he was in England. ‘Double Sin and Other Stories’ (US) contains eight short stories, which cannot be found together as a collection published in the UK, but can be found as parts of four other collections in England (‘Poirot’s Early Cases’, ‘The Adventure of the Christmas Pudding and Other Entrees’, ‘Miss Marple’s Final Cases and Two Other Stories’ and ‘The Hound of Death and Other Stories’). Many of her short story collections suffered the same fate. Whether it was because of cultural differences or for financial reasons, that Agatha Christie’s and/or her publishers chose to separate and publish her short stories in different collections, we may never know. To get a definitive collection of Agatha Christie’s short stories has, perhaps, become as much a challenge to unravel as anything Christie herself wrote. To the ‘Queen of Crime’, long may she reign…..
Dame Agatha Christie: 15 September 1890 – 12 January 1976. 1.‘The Mousetrap and Agatha Christie’ by Sir Peter Saunders, in ‘50th Year Agatha Christie’s The Mousetrap’, Souvenir Brochure. 2. Wikipedia, the free encyclopedia. © Valerie Ann Lettau 20th May 2009. All rights reserved. No part of this article maybe reproduced, stored in a retrieval system, or transmitted in any form or by any means, electronic, mechanical, photocopying, recording, or otherwise without the prior permission of the author.